Just as it seems the question of police brutality largely involves white cops attacking unarmed racial minorities, it emerges that African-American police officers face a whole range of injustices from within the force. An overwhelming majority of injustices perpetrated by one police officer against another involved black cops being mistaken for criminals by their white colleagues. But the statistic only emerged in a task force report in 2010, when the first comprehensive study of the problem was carried out, Reuters reports. The fresh disclosure to the news agency of a slew of accusations and complaints of racial profiling filed by black officers comes at a difficult time for America, which is already preoccupied with allegations of police brutality – largely white-on-black. The current tension in race relations in American society has even escalated to a black gunman murdering NYPD cops in retaliation amid nationwide protests over the question of police using disproportionate violence against unarmed black men. But these questions may have largely overshadowed the dangers of being a black police officer in America, as Reuters found out when it interviewed 25 officers, 15 of them retired. It revealed a climate of fear and systemic racial injustice which stretches even into the official departmental complaint system and Internal Affairs. Normally confidential names of black officers are apparently released in order to keep them in check. When not wearing a uniform, it seems the officers are viewed as criminals that require an excessive amount of questioning and force to be used. The most common cases include being pulled over for routine vehicle and license checks, frisked while shopping, physically manhandled, tripped up, slammed against the hood of one’s car and handcuffed – not necessarily in that order. One of the most severe allegations involved a black police veteran of 30 years, who was leaving a party wearing civilian clothes and some flashy jewelry. Exiting a New York nightclub sometime before 1am in 2012 he was involved in an altercation with white cops who pushed him up against his Escalade and took him away in handcuffs. “If I was white, it wouldn’t have happened,” Harold Thomas, formerly of the elite Joint Terrorism Task Force, said. Most of the officers questioned by Reuters had experienced this on multiple occasions, while five had guns stuck in their faces. One such officer, Desmond Blaize, formerly of the 41st Precinct in the Bronx, was taking a jog one day through a more affluent part of Brooklyn. “I had my ID on me so it didn’t escalate… but what’s suspicious about a jogger? In jogging clothes?” Blaize ended up suing the department for racial harassment. However, an African-American colleague of Blaize’s from Los Angeles believes things aren’t as clear-cut. “It makes good headlines to say this is occurring, but I don’t think you can validate it until you look into the circumstances they were stopped in,” Bernard Parks, former chief of the LA Police Department, told Reuters. What is clear to Parks is that most offenders are, after all, racial minorities. Therefore their ill-treatment is pretty much down to statistics. According to those defending the NYPD’s treatment of both black civilians and cops, the practice of racial profiling that often ends in being roughly tripped up, slammed against the wall and handcuffed is justifiable, borne out by the fact that New York is no longer the murder capital of the United States. Moreover, while they comprise 23 percent of New York’s population, black people were responsible for 72 percent of shooting attacks in New York in 2011. But as numerous academics have pointed out to Reuters, a number of factors can cause statistics to be mishandled. For instance, the disproportionate focus on African-Americans, leading to increased attention directed to black crime. One statistical counterpoint is that over 90 percent of blacks who are stopped for one reason or another are found simply to be minding their own business. And yet all 25 of the interviewed officers reported being racially profiled. Of those, only a third filed complaints, officially or unofficially. Twenty-four of the interviewed officers reported being racially profiled by their white peers when off-duty and not in uniform. Similarly, 24 said that some form of punishment for complaining ensued, either in the form of disciplinary action, denial of overtime, promotions, or specific choice assignments. They say there is a sense among black officers that reporting is more trouble than it’s worth. The NYPD declined to comment either on numbers or on the treatment and handling of cases. In 2010, a police report documenting police shootings of police officers mistaken for thugs found that the overwhelming majority of police officers who suffered ill-treatment by their own in the last 15 years had been black. Even a veteran on the force with a 22-year career in Brooklyn, now president of the borough, Eric Adams, tells the news agency he had always felt stigmatized and received unwelcome attention from a department that wanted nothing to do with his complains of racial profiling. “There’s no real outlet to report the abuse,” he says, telling the agency about the gross misconduct inherent even in Internal Affairs. 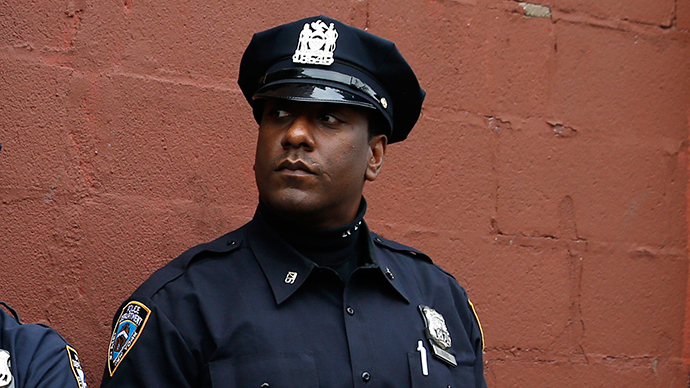 With the current focus on police racial profiling of suspects across the US, the plight of black officers may shed further light on the issue – if these cops can find support within their departments to do so.